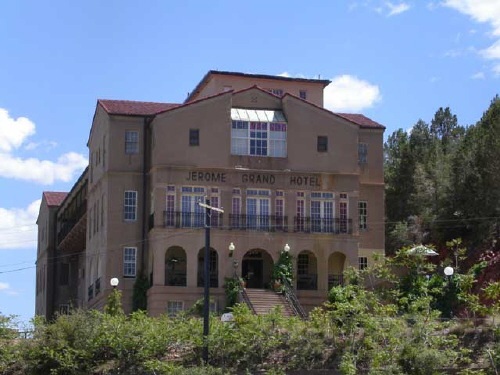 Is the Jerome Grand Hotel haunted? The Jerome Grand Hotel was constructed in 1926, starting out as the United Verde Hospital, opening January, 1927. In 1930, it was written up as the most modern and well equipped hospital in Arizona and possible the Western States. The Hospital was closed in 1950 as the mine operation was being phased out. The building stood unused for the next 44 years until the rehabilitation plans started in 1994. It is still open today as a hotel. There are three main ghosts reported to be at the hotel, The first is that of a women in white, she can be seen roaming the corridors late at night, rumor has it that she was a woman who died during child birth when the building was a hospital, and that she forever search's for the grave of her child, who also died at the same time. The second most common ghost tale is that of seeing a nurse carrying a clipboard, she is said to walk the rooms of the 3rd floor bending over bed's that no longer exist and checking on patients who have long since died. The 3rd and most commonly experienced ghost is that of a Claude Harvey, who was a man killed in an elevator incident in 1935. It is said he can be seen roaming the whole of the hotel and its basement, some speculate that he was murdered. Other paranormal experiences at the hotel include the sounds of coughing and wheezing coming from one of the rooms, ghostly lights in unoccupied guest rooms, and the smell's of cigar and tobacco smoke coming from areas that are non-smoking and unoccupied.